Till i began tweeting & meeting tweeple, that’s been like nearly 2 years to be precise, i always FIRMLY believed that what is virtual is NOT real. And those friends met on the net should remain there, not be met in real world. This was till I began tweeting, first in 2009 when my trainer Craig Zelizer invited me to twitter. Initially I had NO clue what twitter was all about. I was using only FB then. I’d surf to see whether i’d know anyone & reconnected with long lost friends. But these were known since school or college or professional. strangers, i’d never met. So initially I welcomed myself, left it blank & then forgot. My some friends began egging me that its a good platform for someone like me . Meanwhile I read that the HERO of my life, Micheal Jordan is on twitter. So began looking up to get more info on twitter. Tweets fm Durban, economic forums, international arena were being written in newspapers. Then learnt Prez Obama, Julia Roberts, Kevin Spacey Shirley McClaine & many more are there…I wanted to be in this company on the virtual world. So far as it was NOT real. Little did i know the people who’d follow me or i’d follow…as the tweets from my end increased followers began. Mostly friends & they would suggest who i should follow. Earlier i’d pen my thoughts & instead now put it on twitter. Also it came as a rescue operation, especially in times of meetings, which are a bore, which ever organisation you are in. The one thing that twitter did was help me release my energy. I returned from a fellowship in Thailand, where I made really nice friends & some became each other’s followers on FB, Twitter, now Google+. I made a rule that unlike FB, where everyone seems to know everyone, my twitter account would be new persons primarily…there are always some good old friends, old forgotten acquaintances, colleagues who i’d like to follow. But i’ve avoided following some whom follow because you have to….i can’t be compelled. The person’s tweets & views is what influences my choice. Walunj as i like to call him, because Patil is a name that has many a political overtone…and some connotations too…like the dialogue in a Marathi film on politics of Maharashtra. Anyways, meeting Walunj really made believe there are many nice persons out there on twitter who are genuine. In the above pic you see is Rajesh on left. He is my walk partner. He read Mahafreed’s & my tweets & he too joined us. Coz we are neighbours. He knew M, but i got to know him on the walks. 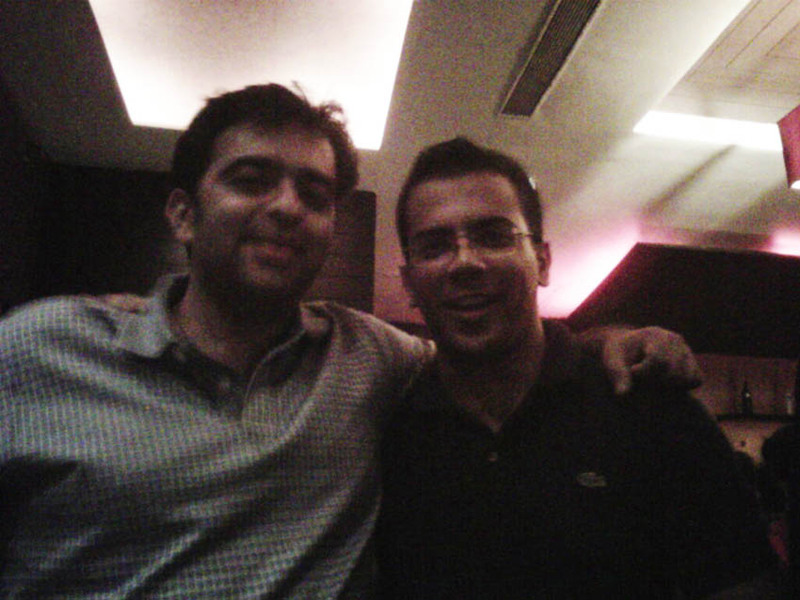 And thanks to Rajesh i went for my first, virgin tweet up! I am adventurous in many ways, but i don’t like a big group or crowd of strangers or only acquaintances, i prefer small group of close friends. This was something absolutely new to me. However i was excited coz there were many people who i wanted meet…calamur, b50, anaggh, jiten who is an old buddy…so on. People who i like because of their ideology, the way they think & their outlook in life. Some because they are sooo cool in life…Now here is the difference. On other sites, networking, FB whatever you write, put up on walls, you don’t understand the real person. You merely get a peek in their lives…Here before you meet you have read the person’s mindset..tweets have been exchanged, whether you agree to them or not. And so as rajesh said he will go for the tweetup i told him i’d like to accompany him…i wouldn’t have gone alone. There it was fun. mid-way in the tweetup I met Rajat KL (the one on right in the pic) I saw him as sitting by himself. He came & introduced & just began praising Mumbai city & her spirit. He wants to move here eventually & was narrating to me in great details how a tweet up as rocking as ours would never happen in Delhi. “So many people at a public place & meeting for the first time. It would never be so successful in Delhi…Only those with political connections have a pull, people don’t meet ordinary people, met on twitter..aur aise restaurant mein milna, toh nanmumkin …etc” I told him amidst us were CEOs, Entrepreneurs, who’s who of Mumbai & all were together for the first time…all to meet Surekha Pillai…a media professional…it was an amazing experience. My dear friend S in Muscat had tweeted I should go & hug Surekha. I recognised her fm her twitter DP, she was direct (so nice) said that I owed her a hug & it was sooo nice that the first meeting was so warm & direct.